Only one of the Wi-Fi devices has to be specifically designed for Wi-Fi Direct; the other needs plain old Wi-Fi capability. Your Samsung Galaxy Tab 4 NOOK has Wi-Fi Direct functions, but this technology cannot always find another device. When the software catches up with the hardware, you’ll be able to communicate from device to device as simply as you can with standard Wi-Fi. Swipe down from the top to display the notification panel. If it isn’t already selected, choose the Connections tab. If it isn’t already on, slide the Wi-Fi switch to the right. Tap the Wi-Fi Direct button in the upper-right corner of the screen. The tablet starts scanning for a usable direction wireless connection. Available devices are listed onscreen. If you want to connect to more than one at a time (another advanced technology not yet fully supported), tap Multi Connect in the upper right. 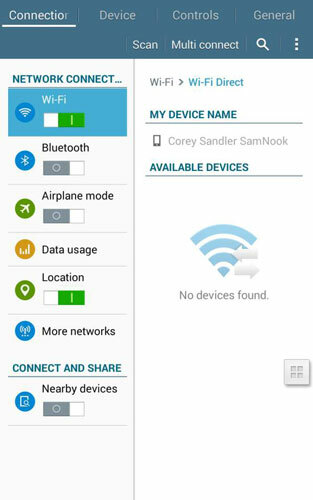 To disconnect from Wi-Fi Direct, tap End Connection or slide the Wi-Fi switch to the Off position.